In this activity, students put their observational skills to work as they take on the role of sedimentologists in the core description lab. In addition to visual descriptive information, they use proxy data, including microfossils, and Earth's paleomagnetic record to determine the ages of the sediments as they build evidence to interpret changes in Earth's past climate. They use actual core data collected during Expedition 341. Describe physical characteristics of sediment cores. Use visual descriptive information to make inferences about past climate in S. Alaska. Determine the ages of sediment cores using microfossils and paleomagnetic data. Explain how oxygen isotopes can be used as a proxy for past climate. 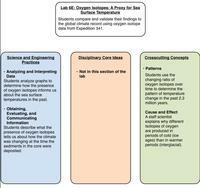 In Part B: Students use "The Core Lab" visualization to examine sedimentary features of core U1417B. They use the series of features to make a hypothesis: What was the climate like in S. Alaska during the time the sediments were being deposited? In Part C: Students gather evidence to support their hypothesis. They interpret paleomagnetic data collected during Expedition 341 to determine the approximate age of the sedimentary core sequence from 260 to 360 meters below the seafloor. Students then tie the information back to their Miocene Timeline. In Part D: Students continue to assemble evidence to support their hypothesis by again using the "The Core Lab" visualization. This time they examine microfossils found at different points in the sediment column. Then they estimate the relative ages of the sediments from site U1417 B based on microfossil and paleomagnetic data they have collected. Does this estimate agree with their findings in Part C? 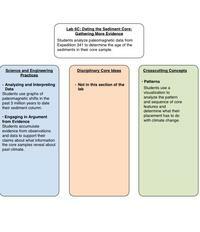 In this culminating activity, students should work in teams of 4 to analyze real data from Expedition 341 to make an interpretation about the Earth's past climate. Each student will become an expert in their field as they take on the role of a different member of the science party. Assign the following roles before students begin Lab 6: Sedimentologist, Paleontologist, Paleomagnetist, and Chief Scientist (i.e. the group leader). Students will be challenged to present their findings to the science party (i.e. the rest of the class) at the conclusion of this lab. 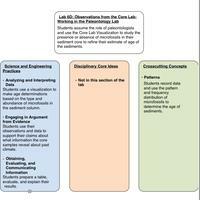 Check for understanding to make sure that each group member understands what their role is before beginning the lab. Students should use their prior knowledge to make a prediction of the types of sediments that might be deposited in deep v. shallow ocean water. Encourage students to look back at previous labs in the sequence if they are having difficulty making their predictions. They should recall from Lab 4 that the energy of water (fast v. slow moving currents) affects the size of sediment particles that are deposited in the ocean. They should also recall that more sediments will be deposited in the ocean during periods of glacial advance due to the erosional power of glaciers (Lab 3). Encourage students to discuss their predictions with their team and remind them that there is no wrong answer. They will be gathering evidence to test their predictions as they work through the different parts of this lab. The "Core Description Glossary" depicts a variety of sedimentary features present in cores from the Gulf of Alaska. To save paper, you may want to have students view the glossary in pairs on the computer. If printed, you will need to make at least one color copy per group. Alternatively, you could print one color copy and post each page around the room (or on different tables) so that students can visit different stations to obtain the information. There are 7 different types of sedimentary features depicted in the glossary: 1) Typical deep water sediments in the Gulf of Alaska (e.g. mud); 2) Evidence for changing energy conditions; 3) Evidence for life at the sea surface; 4) Evidence for life on the sea floor; 5 and 6) Evidence for ice on land and in the ocean; and 7) Evidence for volcanic eruptions. You might choose to have the student who is assigned the role of "Sedimentologist" record observations in Table 1. Be sure to go over the Stop and Think questions as a class before moving on to Part B. The "Sedimentologist" can also be the group's spokesperson as you go over these questions as a class. Students will use "The Core Lab" visualization to examine a series of cropped images that are stitched together to form a composite image. The core showcased in this visualization was collected from a deep water drilling site (U1417B) in the Gulf of Alaska. The composite core in the visualization represents ~100 meters of core, with interesting features (bioturbation, dropstones, etc.) shown in each section. The black spaces between each cropped image represent areas of absent data so that interesting sedimentary features are showcased. You may want to tell students that long stretches of gray mud exist between each cropped image in the visualization, and that sections of core containing interesting information about the Earth's past are showcased in the visualization. Students should begin using the "The Core Lab" visualization with the "Hide" button selected on the "Core Feature Rollovers" section (clicking "Show" will provide students with hints about sedimentary features in the core. 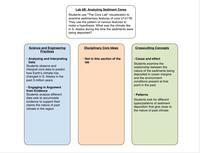 Students should begin by describing the sedimentary features in the core without any hints. Encourage students to reference the "Core Description Glossary" from Part A to help with sedimentary feature identification and for information about what the sedimentary features might indicate about the past environment. Instruct students to click "Show" sedimentary features after they have made their initial observations. There are two types of "hints" shown in the rollovers - the square magnifying glasses highlight meaningful sedimentary features, which they should note here. The should ignore the circular magnifying glasses which highlight information about microfossils present in the core - they will use this information in Part D.
Students do not need to describe every section of the core; the goal is to get an overall picture of how environmental conditions on Earth were changing and the position in the core that these changes can be observed. Students should notice that the types of sedimentary features start to change at 147.5 cm - 156 cm where a dropstone is present. This feature and features such as ice rafted debris in younger sediments provide evidence for colder climatic conditions. Below this section of core (from 156.5 cm - 282.5 cm, in older sediments) the core is heavily bioturbated which provides evidence for an abundance of life on the seafloor. Students should view and discuss "The Core Lab" visualization as a team, but you may want to have students working on their own computers or in pairs so that they can see the visualization well. The student who is assigned the role of "Sedimentologist" should become an expert in this part of the lab; they will be responsible for synthesizing this information at the conclusion of Lab 6. Do a simple demonstration with iron filings and a dipole magnet to help students visualize the Earth's magnetic field. To do this demonstration, place a dipole magnet underneath a sheet of white paper. Sprinkle iron filings on top of the paper and have students make observations about the orientation of the magnetic minerals. Remind students that sediments contain magnetic minerals that become aligned with the Earth's magnetic field when they settle to the ocean floor. Once the sediments become buried underneath successive layers, this magnetization becomes "locked in." Scientists measure the orientation of magnetic minerals in rocks and compare the pattern of reversals (which look like a barcode) to a global pattern derived from the magnetic record recorded in volcanic rocks on the seafloor and seafloor sediments. Watch the video on magnetic field reversals as a class and facilitate a discussion with the students to clear up misconceptions about the Earth's changing magnetic field. It is important to note that scientists have constructed the Geomagnetic Polarity Timescale, in part, based on the magnetization of volcanic rocks on the ocean floor. Check out an interactive visualization showing the nature of magnetization around mid-ocean ridges. The paleomagnetic data in this activity has been modified from its original form (an excursion at ~240 m has been covered up for ease of interpretation). The answer key shows the unmodified data, which includes three holes drilled from this site. Show students the actual data after they have made their interpretations. Students will use the "Polarity" column to shade in regions of normal polarity (positive inclinations) and should leave periods of reversed polarity blank to reveal their own "barcode" interpretation of the data. Students will analyze the data to estimate an age of the sediments by matching their barcode pattern to the Geomagnetic Polarity Timescale to the right. Their interpretations may vary, and this is to be expected. 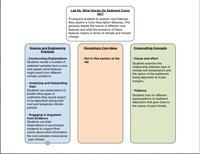 You may choose to have groups share their interpretations with the class to initiate a class discussion. Remind students that they are matching their pattern to the GPTS pattern and that the thickness of their bars might be different from the GPTS due to different rates of sediment accumulation (higher deposition rates = thicker bars). In general, students should interpret the upper part of the core (from ~220 m – ~290 m) as reversed polarity, and the sediments from ~295 m - ~320 m record a period of reversed magnetic polarity. When matched to the GPTS students should observe that the data records the reversal that occurred at ~2.6 million years ago (Ma). When they compare this age to the Neogene-Quaternary timescale from Lab 5B they should see that this age corresponds to the start of the Pleistocene Epoch. Students will need to view "The Core Lab" visualization with the "Show" button selected under the "Microfossil Rollovers" section. Students will gather information using the round magnifying glasses, which show pictures and pertinent information about microfossils in the core. The information gathered will help students determine the age of the sediments, and will provide students with information about the climate when the sediments were deposited. Remind students to record their microfossil data in order from youngest (top of core) to oldest (bottom of core) in their data table. 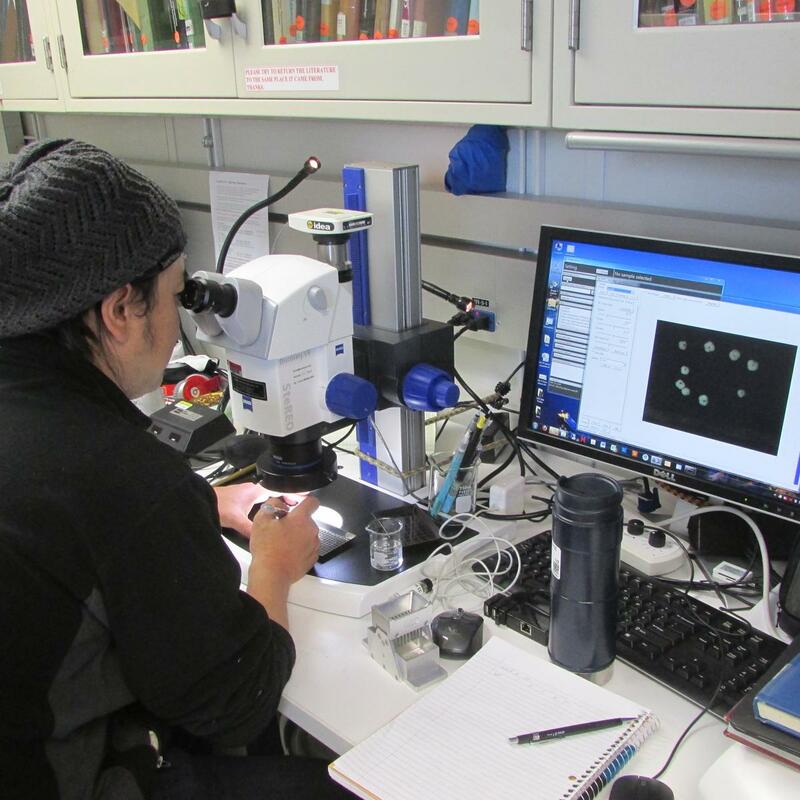 Visit the JOIDES Resolution Education & Outreach page on Microfossils to learn more and see videos from the scientists on board. After students complete their projects, have the groups report their findings. Have them critique or grade each others' work. Describe what it means to "do science." Why is it important to accumulate different strands of evidence before publishing your findings? Who were the main players were in your collaboration that helped you determine what the past climate was like in S. Alaska? What are your thoughts about becoming a scientist and joining an expedition of discovery similar to Expedition 341? Teachers may decide to collect the handouts students fill out and grade them. Grade the summative group projects (Part E). Oxygen isotopes are one of the most powerful pieces of data scientists use to decipher the Earth's past climate. Visit NASA's Earth Observatory website for more information about oxygen isotopes.